Get a Free Starbucks Blonde Roast for entering their naming contest. 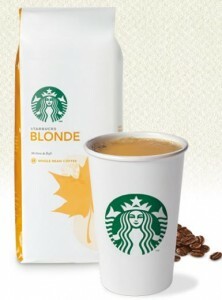 Starbucks wants Canadians to name their Blonde Roast blend. This contest starts January 28,2013 and ends February 25,2013. From their site: It’s not every day you get to name a Starbucks blend. But it kind of made sense to ask you to name it. That’s because Canadians everywhere have embraced our mellow, easy-drinking Blonde Roast. So enter our naming contest. You could win a trip anywhere in Canada to meet a friend for coffee. Plus, there’s the thrill of seeing your winning name proudly displayed on every pack of Canada’s favourite Blonde Roast.